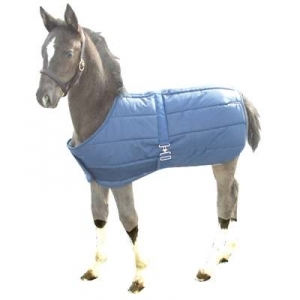 Rest Assured you will receive a top quality Snuggie Foal Blanket delivered straight to your door. It is made out of a 420 Denier outershell with a 70 Denier lining, in between is a 280 gram fiberfill. It has one adjustable closure at front and a surcingle at the belly. This Horse Blanket grows with the foal from 28'' to 44''. This Snuggie Foal Blanket is made from the finest materials available. Extraordinary feel, yet are easy to work with and provide maximum comfort for your horse.